Desert Speedtrap - Starring Road Runner and Wile E. Coyote - Cheats - SMS Power! Select tune 09 and sound 12. Now you can select "CHEAT" in the Game Mode option. You are no longer hurt by anything. Select tune 10 and sound 07. Move the cursor to Exit and press / to select your starting level. 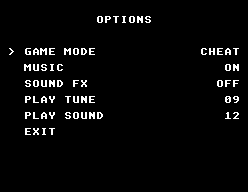 Note that the maximum level selectable is higher if the difficulty level is higher; and that Cheat Mode lets you access all the stages.